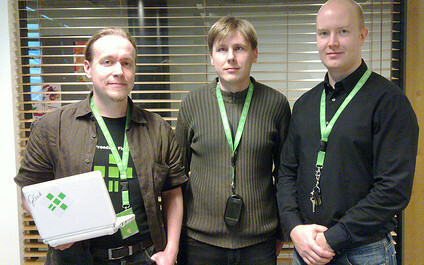 Free Software Foundation Europe, has recently expanded by the addition of a Finnish country team. FSFE is a non-profit organization dedicated to ensuring software freedom, which is an important building block in an open information society. While COSS is already doing important work for free software in Finland, FSFE amends that agenda by providing focus on the freedom of software and citizen-level participation. If you're interested in contributing to software freedom, start by joining the Fellowship of the FSFE. You can also contact us at finland@fsfeurope.org and find out more about what is happening in Finland in the field of free software by following the vapaasuomi.fi website. 05 May 2006. 1 minute read. I met the Free Software Foundation Europe president Georg Greve in the FISL 7.0 conference two weeks ago. Seems like the organization is doing lots of good fighting software patents and other threats here in Europe. 11 January 2008. 1 minute read. COSS - the Finnish Centre for Open Source Solutions - is a national development agency for open source business ecosystem. COSS consists of 125 Finnish Open Source companies, several universities and public administration.